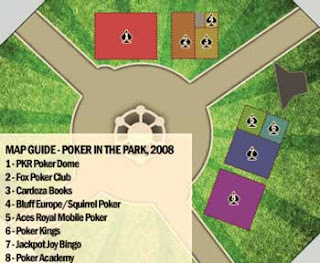 Poker in the Park will fill London’s Leicester Square’s North and East quadrants with the biggest poker fair in Europe. The centre of attention is sure to be the PKR-sponsored ‘Poker Dome’, providing free play public tournaments each hour of the event. Every table will have professional dealers from Ace Poker Nights giving players the experience of professional play. Additionally, tournaments will be broadcast on the festival Jumbotron. For those who want to learn more about the game, the Poker Academy brings the best players in the UK to teach the secrets for winning at poker. The Poker Academy will be located on the South side of the East quadrant. Fox Poker Club, London’s newest poker only club, will host their ‘VIP Lounge’ for attendees to relax in between playing and learning. Cardoza Publishing is bringing their arsenal of the hottest poker titles on the market, including the new classic from Daniel Negreanu. Squirrel Poker will also be on hand selling all the essential equipment and Bluff Europe attire for the budding poker pro! Aces Royal is introducing users to their mobile poker game, while Poker Kings demonstrates why they are one of the fastest growing online poker rooms in Europe. Jackpot Joy will be showing off an array of casino games in their ‘Deal or No Deal’ game for mobile phones. Poker in the Park 2008 will take place in front of ‘The Casino at the Empire’, who are sending their famous showgirls to the event. The event will feature over 4,300 sq feet under tents. 25,000 people will pass through the event made up of live entertainment exhibitions, eleven seminars at the Poker Academy and over 2,200 hands of poker at the Poker Dome. Poker in the Park is the largest poker extravaganza in Europe and everyone over 18 invited.